Healthcare IT outsourcing is one of the practices which reduces the cost in the market. IT principally gains support from various government regulations and initiatives from government to underline the need for cost-efficient and high-quality healthcare services to offer the public. One of the larger emerging trends in the healthcare industry is to be third-party IT outsourcing. Additionally, demand for healthcare IT outsourcing is projected to increase due to rising need of reduction of in-house healthcare IT expenses. Additionally, growing investment in healthcare infrastructure is another factor leading to increase demand in the world healthcare IT outsourcing market. Increasing need for patient satisfaction and improved productivity and availability of services in reduced costs is forecasted to augment the demand for IT convergence in healthcare. However, loss of trust due to confidentiality issues and data breach hampering adoption of healthcare IT outsourcing. Additionally, unreliable operation of service providers can limit growth of the market. Also, some language barriers and cultural differences are predicted to create problems in the market. 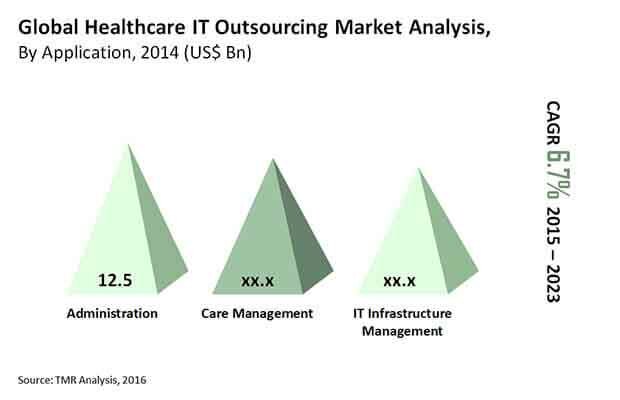 TMR observes, the global market for healthcare IT outsourcing will likely to attain the value of US$61.2 bn by the end of forecast period from US$34 bn in 2014 by expanding with the CAGR of 6.70% between 2015 and 2023. On the basis of application, the global healthcare IT outsourcing market is segmented in to care management, administration, and IT infrastructure services. Of these, administration segment accounted for nearly 37% of the shares in 2014 and expected to continue its dominance over the forecast period. This is attributable to the immense growth in the patient pool and rising investments in healthcare infrastructure globally has resulted in the increased number of healthcare administrative processes. This demand is likely to increase for next few years which is likely to fuel growth of the segment in the global healthcare IT outsourcing market. In terms of revenue, healthcare administration contributed US$12.5 bn in 2014, and thanks to these factors, the segment is projected to rise up to US$21.5 bn by the end of the forecast period. On the basis of end use, the global healthcare IT outsourcing market is segmented in to healthcare providers and healthcare payers. On the basis of the region, the global healthcare IT outsourcing market is segmented in to North America, Europe, Latin America, Asia Pacific, and the Middle East and Africa. Of these, North America dominated the global healthcare IT outsourcing market and accounted for 40% shares of the market. The North America healthcare IT outsourcing market was valued at US$13.4 bn in 2014 and is expected to t attain value of US$21.2 bn by the end of 2023. The market is expected to expand with 5.10% over the forecast period from 2015 to 2023. This growth is attributable to rising initiatives by government in order to available the high quality healthcare services in lower prices mainly in the US. However, Asia Pacific is expected to expand with higher CAGR of near about 10.50% over the forecast period. Some of the key players operating in the healthcare IT outsourcing market are IBM Corp., Tata Consultancy Services Ltd., Wipro Ltd., Cognizant Technology Solutions, and Accenture Plc. Unmet medical needs in emerging nations is a crucial driver of the global healthcare IT outsourcing market. As these nations boast abundant availability of skilled manpower, major players can seize increased share if they enter into strategic alliance with local players operating in these nations. Consequent to the rising IT outsourcing in the healthcare sector, the quality of patient care has increased. The industry has benefited from greater access to means if healthcare IT technologies as well. Based on application, IT infrastructure services, care management, and administration are the key market segments. By end use, the market can be bifurcated into healthcare providers and healthcare payers. Besides evaluating the various aspects chalking the market’s progress across the aforementioned segments, the report profiles some of the major vendors in the healthcare IT outsourcing market. Strategies adopted by these companies, their market positioning, and development trends are identified in the report. The report presents a detailed analysis of the global healthcare IT outsourcing market, covering various factors supporting its growth and those posing threat. The report is intended to enable stakeholders get a better and more comprehensive perspective of the market. The findings of the market study can prove helpful to companies, investors, policy makers, and regulatory authorities who aim at expanding their reach worldwide. The trend of third-party outsourcing is making wave in the healthcare sector. With favorable regulations and initiatives by various governments aimed at promoting high quality but cost-efficient healthcare services, healthcare IT outsourcing is expected to pick pace in the coming years. The outsourcing solutions are designed to help curb expenses incurred on in-house healthcare. This has emerged as a crucial driving factor for the market and is unlikely to decline anytime in the near future. The spike in demand for IT outsourcing in the healthcare sector is indicative of the market’s promising growth. However, with the integration of information technology, the threat of data break and loss of confidentiality is expected to scale. This factor will continue posing threat as long as healthcare IT outsourcing remains vulnerable to cyber threats. Additionally, the high fragmentation in the healthcare and medical sectors may create bottlenecks in the execution of IT platforms in the industries. This will in turn obstruct operations of service provides. Besides this, language barriers and cultural differences may hamper the market’s growth to an extent in the coming years. Regionally, Europe, North America, Asia Pacific, Latin America, and the Middle East and Africa constitute the key market segments. Among these regions, North America had command over the dominant 40% of the global healthcare IT outsourcing market in 2014. Its dominance is expected to remain intact over the forecast period, as the region exhibits high adoption of advanced IT outsourcing solutions and boasts a sophisticated healthcare infrastructure. However, its Asia Pacific counterpart is expected to showcase a stronger CAGR of 10.5% between 2015 and 2024. The escalating demand for outsourcing services in the healthcare sector has deepened the competition within the global healthcare IT outsourcing market. To capitalize on the prevalent opportunities, the vendors are looking to provide improved patient data management solution and develop their own analytical platforms. In addition, strategic partnerships and offering low-cost advanced solutions are considered crucial for players who aim consolidating the lion’s share in the market. Some of the leading companies profiled in the report are IBM Corporation, Accenture Plc., Cognizant Technology Solutions, Infosys Limited, L&T Infotech, McKesson Corporation, Allscripts Healthcare Solutions, Inc., Wipro Limited. Healthcare IT, Tata Consultancy Services, HCL Technologies Ltd., and Infosys Limited.